Courtesy of Skydeck Chicago The Willis Tower lit up maroon and gold in support of Loyola's Ramblers during the March 22 game against University of Nevada. Loyola’s men’s basketball team has accumulated an impressive nationwide following during its time in the 2018 NCAA Tournament. 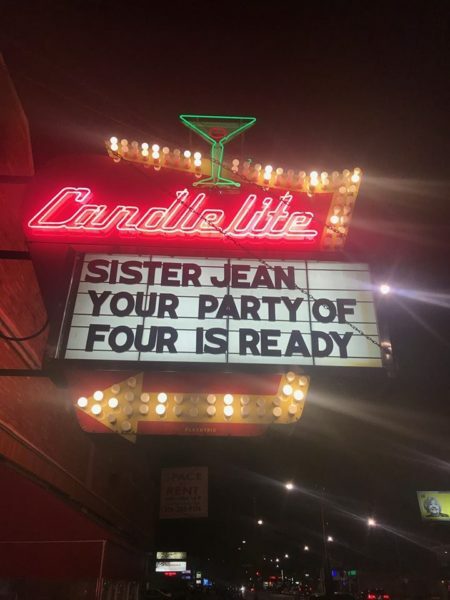 From two Twitter shoutouts from former U.S. President Barack Obama, to Sister Jean being interviewed by news agencies across the country, it’s safe to say the Rambler buzz extends well beyond Chicago’s city limits. However, no town shows support like a hometown. Ever since the Ramblers earned their spot in this year’s tournament, Chicago has been showing its support in creative and eye-catching ways. Here’s five places in Chicago that have exemplified the city’s support for the Ramblers. While the Ramblers were playing Nevada March 22, something unbelievable happened to Chicago’s iconic skyline. 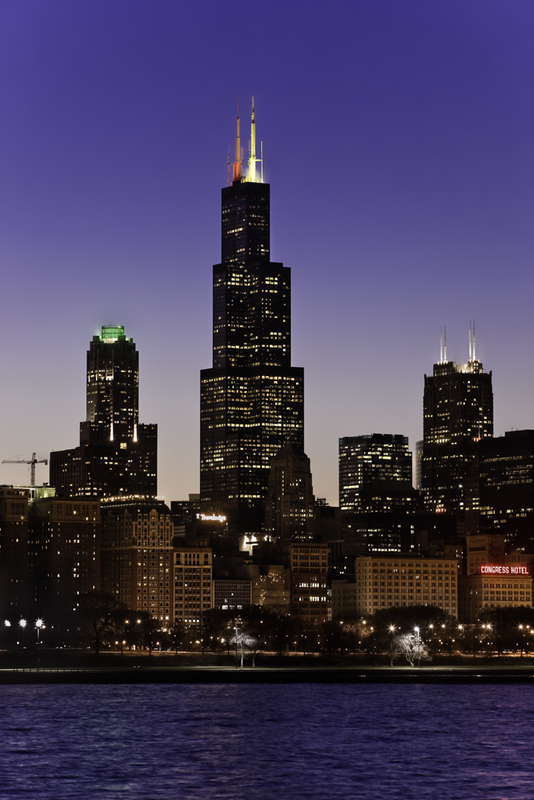 Fans looked on in awe as the massive 290-foot-tall antennas atop the Willis Tower (233 S. Wacker Drive) lit up red and yellow to show support for Loyola’s men’s basketball team. Crews used red and yellow lenses to imitate Loyola’s classic maroon and gold, according to the Chicago Tribune. Just blocks from Loyola’s Water Tower Campus, the top level of the John Hancock Center (875 N. Michigan Ave.) also lit up red and yellow that night. Before Loyola’s men’s basketball team embarked on its journey to Dallas for its first March Madness game in 33 years, it was invited to the United Center (1901 W. Madison St.) March 11 to watch a Chicago Blackhawks game. However, senior forward Donte Ingram also got the opportunity to get on the ice and try to shoot a goal. The United Center showed its Rambler pride by projecting the team’s logo and colors on its facade. The Chicago Blackhawks are only one of Chicago’s teams which has voiced its support for the Ramblers — for example, Cubs first baseman Anthony Rizzo recorded a video for the team March 15, and the Chicago Bulls Twitter account gave the team a shoutout March 24. On March 23 and 24, Navy Pier’s massive Ferris Wheel offered even more proof the city has faith in its Ramblers. The round LED panel at the wheel’s axle displayed the words “Loyola Ramblers” in gold letters beneath the Ramblers’ Lu Wolf logo. In addition to the temporary sign makeover, Navy Pier also offered discounted Ferris Wheel rides on those days — $8, to celebrate the team’s advancing to the Elite Eight. It’s not uncommon to see messages spelled out on the windows of the Blue Cross Blue Shield Tower (300 E. Randolph St.) supporting a cause or after a significant sporting event. But after the Ramblers beat Kansas State University March 24, the building’s luminescent facade spelled out something much different: “Go Loyola.” The words are simple, but when they’re shining on the same building that’s congratulated Chicago’s professional sports teams on their victories countless times, they become something special. The Ramblers will play the University of Michigan Wolverines March 31 in San Antonio. Fans can watch the game on TBS or stream it online at www.cbssports.com.